State of the art automatic battery optimiser. Diagnoses, recovers, charges, tests and optimally maintains, automatically. OptiMate 5 is the perfect battery saving charger for your car, boat or motorhome. The 2.8 Amp circuit is ideal for any 12V lead/acid battery from 7.5Ah to 120Ah which needs to be maintained ready for instant service. OptiMate 5 is the all-in-one tool for 12V battery care at home. 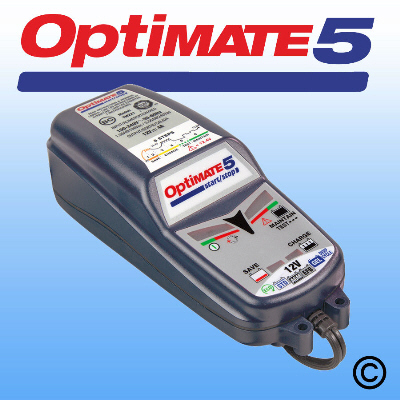 OptiMate 5 has all the fully automatic 100% safe and easy-to-use characteristics of the 1.5 million OptiMates produced since 1995, but adds a powerful 2.8 Amp output to take care of larger batteries. 1. Safety check: OptiMate 5 must be connected to a battery (retaining minimum 2V) to activate its output. 2. Desulphation and recovery: if due to sulphation the battery's resistance is abnormally high, a voltage of up to 20V is automatically applied to overcome this so as to recover very flat or neglected batteries until they are able to accept the normal charge program. 3. Bulk charge: a constant current of 2.8A efficiently brings the battery close to full charge. 4. Charge verification: as soon as the rising resistance causes the charge voltage to reach 14,3V, the voltage is limited at 13.6V for 30 minutes while the circuit monitors the actual voltage and the current absorbed by the battery. If within 30 minutes the automatic circuit judges that the achieved charge is less than optimal, the program reverts to bulk charge and the process repeats. 5. Charge retention test: when the monitored parameters confirm that an optimal charge has been achieved, the first check for battery (and connected system) power leakage commences. Depending on the voltage retained during 30 minutes, an "OK" (green LED) or "not OK" (red LED test result is displayed. These 30-minute test periods repeat hourly until the OptiMate 5 is disconnected, so that the battery status indication is continually updated. 6. Charge maintenance: during alternate 30 minute periods, at a float limit of 13,6V the battery is offered charge current (up to the maximum) it needs to sustain it against any small connected loads or power leakage and against natural self-discharge. OptiMate 5 can stay connected to the battery indefinitely and the battery will stay cool and safe. And optimally charged. Of course. Optional accessories include additional fused permanent connection leads (O1); cigarette lighter plug lead (02) to charge via the cigarette lighter or DIN socket (as found on some BMW, Honda & Triumph touring motorcycles); 1.8m and 4.6m extension leads, weatherproof sockets to provide a convenient 12V supply for sat-nav, MP3 player, mobile phone charger, PDA etc. and much more. Certifications: TUV/GS conformity. 3-year warranty.